Social media music networks have tried to emerge in the past but have made little more than a little extra noise. FANS is a new act in the tour and they may offer music lovers a new tune. We went backstage to explore the whole scene. Launching a social network into an already crowded space is not for the faint of heart, but that is exactly what new entrant FANS has done. Specifically, they’re enabling a new network for the most passionate music fans. It’s a move that has been made before, and one that has resulted in little less than a little extra noise. As soul-soaked as the music space is, nobody seems to have cracked the nut of merging it with the similarly addictive experience of social media. Perhaps what the space needs is a new act? Described in the New York Times as, “a place to talk about concerts,” FANS, according to its website, “is an online community and a tool for music-lovers to embrace their enthusiasm for live concerts, celebrate their music history, discover new experiences and connect with like-minded FANS around their favorite artists.” FANS claims to host the most comprehensive database of concerts—past, present and future—and empowers users to search and build their fan identity through almost 5 million events, 1 million artists, 380,000+ venues and 300,000+ albums. Music people can be finicky. So can software users. It’s hard to know if FANS will be able to find a flourishing space that relies on both. I set out to explore the musical social media scene and find out where they may fit into the lineup. The music streaming social network formerly known as, Whyd is now, Openwhyd. Literally. And figuratively. Originally launched in November 2012, Whyd offered music bookmarking functionality that let users curate music tracks from YouTube, Vimeo, Soundcloud, Dailymotion and various MP3 blogs. Of course, as a social network, users could also connect with like-minded music lovers. The key appeal of Whyd was to be that it enabled music lovers to find and play very specific versions of songs that they love, and are not available on major music platforms such as Spotify or iTunes—like rare remixes, DJ sets, bootlegs and epic live performances. The development team will initially be restricted to a group of the most loyal Whyd users, and will later open to all users that wish to participate. If you’d like to be part of the reinvention, on either side, you can get involved by filling out this form. Think of it as Tinder for lovers of tunes. Tastebuds, an app from a dating site based in London, matches people based on their music tastes. According to the Tastebuds web leaderboard 1,453,203 messages were sent between users of Tastebuds in the last month. Skepticism may be warranted, however. That number didn’t change over the course of writing this article, and the date of their last blog post is “4 years ago.” A tad long even for an EP. This particular romance may be suffering from some significant functionality problems, and perhaps a great deal of lover’s fatigue. Integration with Apple Music, Spotify, and Deezer allows music sharing with others, and collaboration on playlists regardless of which services are being used, while the social aspect of SoundShare works on the Twitter-type follower/following model. If you give the app access to your streaming service and listen to songs in the app, they are added to your SoundShare music stream after thirty seconds. If you prefer to listen to your music through a different app, you can add songs to your stream, or a SoundShare playlist, via SoundShare’s extension. Your followers can then listen to the songs in your stream using whichever service they prefer, add your songs to their streaming service, incorporate songs into SoundShare playlists, post comments, send SoundShare links, and like songs in your stream. The only limitation is that the songs shared must be the libraries of both services for you and your friends to enjoy them. That closing sentiment applies rather appropriately to the space in general—not to mention any attempt in the last 5 years to gain traction as any peripheral social platform (now that the big boys have locked down billions), whether it be for finding your friends, launching discussion threads or sharing image updates. What does the newest act bring to the stage? FANS has perhaps earned a head start simply by way of its personnel. According to the New York Times, for more than two years concert promoter Peter Shapiro has been developing FANS with a team of 10, including co-founder Seth Schiesel, a former reporter and critic for The New York Times. Schiesel, like Peter, is a die-hard jam-band fan. Investment in FANS has been quoted in the press as being “several million” dollars, supplied by Peter’s company, Dayglo Ventures—the holding company for FANS and some other properties—and a handful of others, including Roger McNamee, the Silicon Valley investor, and Wonderful Union, a company that runs fan websites for stars like Taylor Swift and Drake. 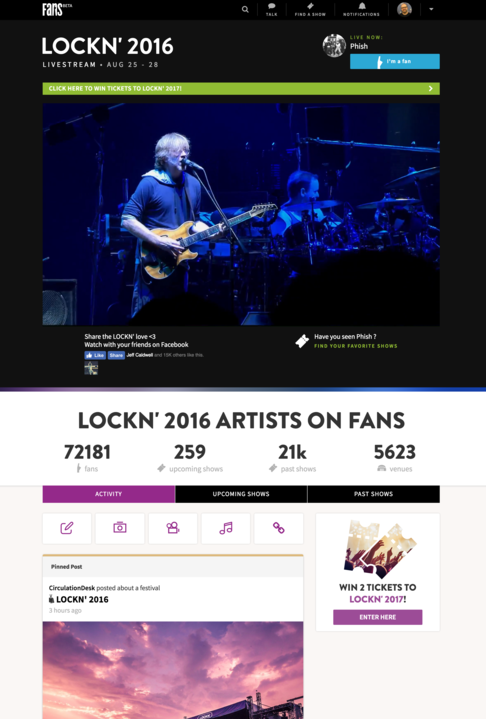 FANS site made its public debut on August 25th with live video feeds from LOCKN’, Peter’s four-day festival in Arrington, Va. The festival featured Phish, My Morning Jacket and Phil Lesh of the Grateful Dead. FANS offers a Twitter-type follower/following model with a clean UX available through an app on iOS or Android or via web on desktop. I had an opportunity to chat with Jeff Caldwell, Chief Product Officer at FANS, during LOCKN’ Festival in Arrington, Virginia. With him, I dug into the details. Will FANS find and keep a spot on the social network rail? Or more accurately, can it create a space that has been suffering from performance jitters and poor attendance? Since their founder is the promoter who’s also putting on the events, FANS’s chances get better with every big gig. Lovers: What’s Hot, What’s Not. And I actually do have a couple of questions for you if you usually do not mind. Could it be only me or does it look like some of these remarks appear as if they are written by brain dead people? Would you list of every one of your communal sites like your twitter feed, Facebook page or linkedin profile? such certain approximately my trouble. You’re amazing! Thank you! Oceanside Harbor Days is actually a planned yearly event placed the 4th weekend in Sept.
to spend your vacation tidying! I found that, at the minimum, each of these was a great way to discover new music. I glad that you found the article useful, Esther! Thank you for your feedback! I have used SoundShare and I really like the features. Like the ones that you outlined here, there are plenty of ways to use the site and many users to interact with. I just wonder why it would only be available on the iPhone. As someone who has an Android phone, that is a question I often ask myself, Emily! Fewer handsets to deal with, and the safety of the walled garden that is iOS may be some of the reasons for the iPHone first mentality of many developers. Without reading through each of the descriptions too closely, are any of these social networks like the “Rotten Tomatoes” for music lovers? The focus is on social as opposed to being a ratings system. Even though social networks are popping up all over the place, I see no problem with one being started up that caters to just one niche. The music lovers are a tight knit group, depending on genre of course, but at least they know where they stand if the entire network has the same feelings.